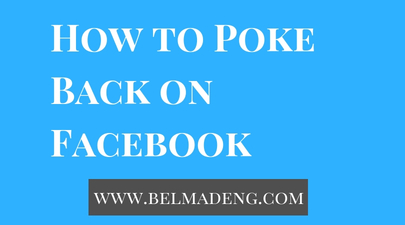 How to Poke Back on Facebook: Do you know that you can poke people back on Facebook when they poked you? Facebook poke feature was a fun one until users got worried about what it really meant. The row led to the point that many users quit using it. I suppose that's the reason Facebook is burying this feature under facebook.com/pokes. 2. The list of all the people that have poked you will display. Note that people can poke their friends or friends of friends on Facebook. When you poke someone, they'll get a notification. However, if you don't want someone to poke you on Facebook, you can block them ASAP. Click here to see how to block people on Facebook. See: How Do I Block Messages From Someone on Facebook Messenger? How does blocking work in Facebook Messenger?